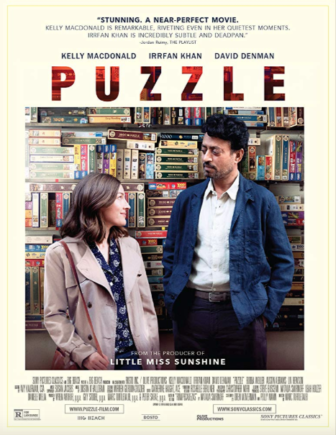 Darien Library’s Friday Night Feature is “Puzzle,” a 2018 drama much praised by critics. The library will have two showings: 6:30 to 8:15 p.m. and from 8:30 to 10:15 p.m.
“After years of concerning herself exclusively with the needs and wants of her husband and sons, Agnes has found something that she wants to do: puzzling. “Stepping out of her domestic bubble to pursue her new hobby, Agnes meets Robert, a wealthy, reclusive inventor who recruits her as his partner for an upcoming world jigsaw tournament. “Each day she spends out in the world takes Agnes further along on the road to a new understanding of herself. “PUZZLE is a closely observed portrait of Agnes, who has reached her early 40s without ever venturing far from home, family or the tight-knit immigrant community in which she was raised by her widowed father. Darien Library is showing the 2018 film, 'A Simple Favor,' staring Anna Kendrick and Blake Lively, at 6:30 and 8:45 p.m. on Friday, Dec. 28 in the Community Room.